The view of Nipper's as you come up the hill. It was the place to party for Barefoot Man. We have become sheep. 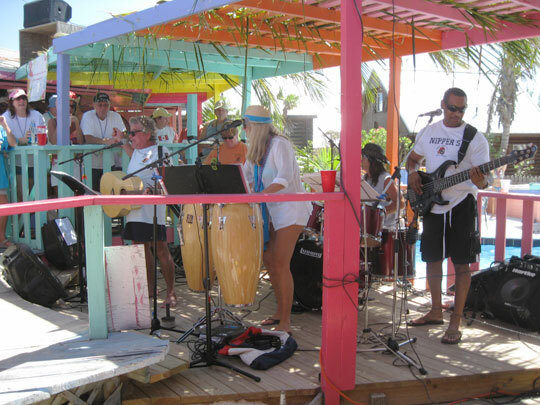 It seems like everyday since we started listening to the Cruiserâ€™s Net there has been talk about the up coming Barefoot Man concert in Great Guana Cay. He was doing two shows at a bar called Nipperâ€™s, one Friday afternoon and another Saturday night. Just his band was playing on Sunday afternoon. Lately the talk has been exceptionally exuberant. People have been inquiring about ticket prices (free) and which Ferries go to Great Guana Cay. We talked to people in Marsh Harbor who were attending. They saw him last year and wouldnâ€™t miss it. Authorities were cautioning against drinking and dinghy driving. Even competing businesses in Great Guana Cay were talking about the show. It seemed like a pretty big deal. Greg and I like music. The price was in our budget. We had spent a week in Marsh Harbor and were ready for some excitement. And, well, everyone else was doing it. So, even though we had no idea what Barefoot Man would be like, we decided to go check it out. Thursday morning we learned that the package we had been spending all of our time in Marsh Harbor waiting for would not be coming until Friday. We decided we could wait until Monday and made plans to head on over to Great Guana Cay to secure a spot in the anchorage and attend the Friday afternoon show. The winds were blowing pretty good as we pulled out into the sea of Abaco, between 19 and 20 knots. 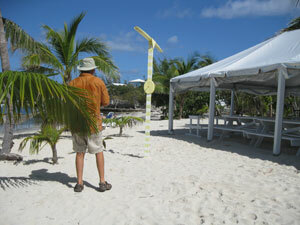 So, we raise only the main sail and had a pleasant trip as we glided on over to Great Guana Cay on a beam reach. When we arrived at the anchorage at Fischerâ€™s Bay in Great Guana Cay, it was already fairly packed and the wind was still blowing pretty strong. But we used the lessons we learned from anchoring in Marsh Harbor, nestled in between a few boats, and dropped the hook without raising alarm. Unfortunately the best spot we could get in the anchorage was a little far from shore and with the high winds, we were rocking a bit much for my comfort. I put on my sea bands and we decided to stick it out. We would spend the whole day ashore the next day to avoid the perpetual bobbing up and down. The next day, after dinghying over to Great Guana Cay harbor and tying up the boat to the public dock we decided to explore a little bit and find the concert venue. Great Guana Cay is what I had been expecting the Bahamas to look like. The main street is narrow and cozy. It is lined with a few colorful shops, bars and restaurants. Everyone walks or rides in golf carts. It is slow, bright, friendly and warm. The perfect island get-away. The Barefoot on the far left with the guitar whips up the crowd. Nipperâ€™s was fairly easy to find. Many signs pointed the way. 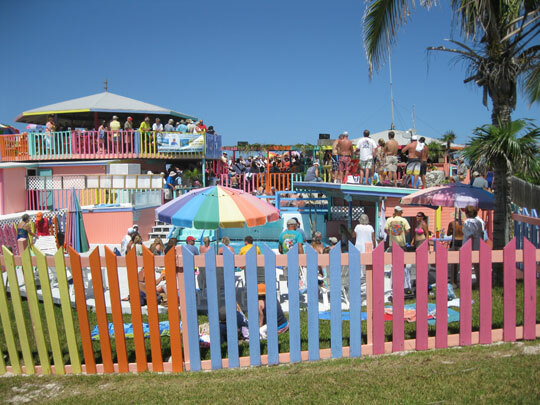 Off the main street you make a left at Pirateâ€™s Cove, a right at the cemetery, a left at the art tractor and then up the hill to the brightly colored open-air bar with two swimming pools sitting high on a dune overlooking the Atlantic Ocean. It looked like a party waiting to happen. Barefoot Man and his band were just warming up when we arrived, so we decided to do some more exploring and then find lunch. We ended up at Grabbers, another bar with a pool, overlooking Fischerâ€™s Bay, the anchorage where Blue Wing sat bobbing along with all the other boats. We watched as boaters pulled up on the beach in their dinghies and sunk an anchor into the sand. We didnâ€™t realize this was an option for coming ashore, but since it was much closer to the anchorage we noted to remember it for next time. We played a Bahamian ring toss game and sat in the shade and played a few hands of cards while we waited for lunchtime to roll around. 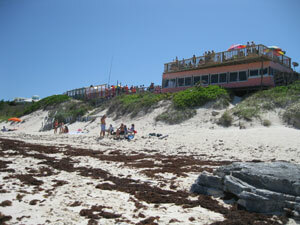 A view of NIpper's from the beach. This was our first meal off the boat since we left Stuart. It was slow and relaxed. Slow because our waiter didnâ€™t seem quite awake yet and relaxed because we were on Guana time and we knew heâ€™d bring up the right food eventually and that the cup of ice he brought us would eventually melt and we would have the glass of water we ordered. After lunch we headed back to Nipperâ€™s. Sounds of the Barefoot Man wafted down the hill as we rounded the corner at the tractor. The Barefoot Man was not what I was hoping for. He was what Greg expected, only a little better. Nipperâ€™s was packed full of dancing vacationers and boaters. The crowd was having a big time and sang along with all of the songs. As we walked into the bar, I realized, that this was not going to be some soulful, yet lilting music influence by African drum beats and American rhythm and blues, this was the Jimmy Buffet of the Bahamas. Duwan on the beach in front of Nippers. I know we have a few readers who are Jimmy Buffet fans and maybe even a few that would call themselves Parrot Heads, so I just want you to know that I donâ€™t mean to put the man down or insult any oneâ€™s musical tastes, and it isnâ€™t like I hate Jimmy Buffet, but he just isnâ€™t my thing â€“ and so, neither is the Barefoot Man. What we heard was very clever and extremely well done. 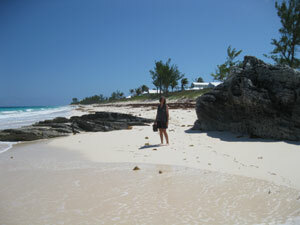 BM sang about the Bahamas, Abaco and Great Guana Cay. He captured the idealistic spirit of the islands and catered to the revelry of the alcohol fueled tourists of rum-punch-ville. The Kaliks clanked and the bikinis danced. And like wayward sheep, with no over ambitious corgi snapping at our heals, we passed right through the herd and wandered down to the beach. After a long walk on the beach we left Nippers behind and headed back down the hill to Pirateâ€™s Cove. Pirateâ€™s Cove is a tiki bar with about a dozen or so seats, a patio with several tables and store that sells drinks, sandwiches and ice cream. We saw the sign that advertised $4 local beer and found a stool at the bar. The proprietor is an older gentleman, named Jerry, who split his time between tending bar and minding the store. The tiki bar was a semi-self-serve operation. When Jerry was too long inside we took our cue from the locals who would go behind the bar and serve themselves. We talked to Dan, a Canadian who moved to Great Guana Cay 5 years ago to escape the big city and a couple of guys, taking a break from the excitement of the concert up the hill, who were staying on Treasure Cay in a house one of them had bought before the economy soured. 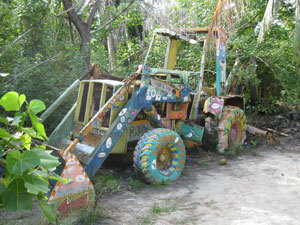 Pirateâ€™s Cove was Gregâ€™s favorite place on Great Guana Cay. We headed back to the boat before dark. The anchorage, thankfully, was much calmer. We had a light dinner and listened as one of our neighbors blew a conch horn as the day slowly faded and the sun set on the sea of Abaco. 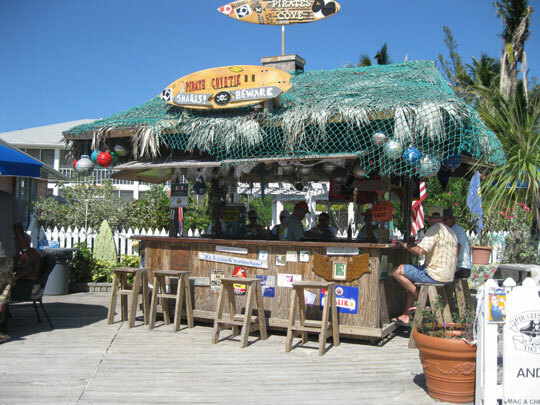 Gotta love a tiki bar! Jerry said Greg can come and play his guitar sometime! This entry was posted in Life on the Water, The Abacos, The Bahamas. Bookmark the permalink. I concur on the Jimmy Buffet music. I actually liked, and still like his early albums…….but he became a parody of himself. Who needs a parody of a parody? Love the colorful little place!!! You would love it, Debbie. You can’t see it very well in the picture but there are two pools at Nippers. The pics are great….really looks like what I would expect….a far cry from city living….enjoy and be safe…. I would like the 2nd seat from the left for a few hours!